Artizania Jewellery: Ring Making Workshop! My next jewellery workshop in Alloa! 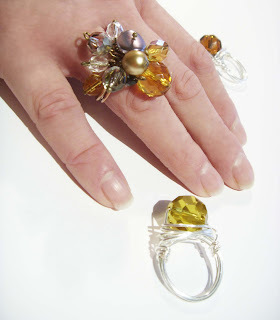 Learn how to make a wire wrapped ring and a beaded cluster ring. Just noticed this listed on the FCA&C newsletter and I've missed it! Will you be doing another class soon as I'd love to give this technique a try. I am so sorry for the delayed answer to you comment!!! I just noticed it now! I will email you properly through the contact page on your website. Again, apologies! You left a comment on my blog (waaaay back in December) about my wrapped wire ring workshop. First of all I have to apologise for not getting back to you! I am mortified to say that I only noticed your comment today! Aaaarrrgggghhhh!! I have now changed my blogger account to notify me by email when anyone leaves a comment! I am sorry, it must have appeared really rude! In response to your question, we do have plans to hold another ring workshop but we dont have a date as such, I imagine that it will be some time in late spring/early summer. However I also hold a "drop in" jewellery club, if you came to that I could certainly show you the wrapped wire ring technique. I'm glad I discovered you, your work is fantastic! I love what you're doing with the old silver tea-spoons! so clever! I see you're on Facebook so I'm away to "Like" your page!